Do chua (literally translated as Vietnamese pickled stuff) is commonly found in banh mi sandwiches. While it can be made of any type of vegetable, it usually means pickled carrots and daikon. The recipe is super-simple and should be adjusted depending on the size of your carrots and daikon. The key is to julienne the vegetables as grating them just makes them a bit too mushy. Since they're pickled, they'll keep for months and months in the fridge. So don't worry if you don't eat it all at once. Those measurements are just guidelines. What I usually do is after julienning the vegetables, I spread them out in a shallow bowl. Then I sprinkle just enough sugar for a light coating. Add a smidgen of salt. Then pour enough vinegar to submerge about half the vegetables. If I'm eating this right away, I like to use rice vinegar for the lighter taste. If you intend to store these as pickles, then ordinary white vinegar is fine. After about 15 minutes or so, stir the vegetables so the vinegar is mixed. 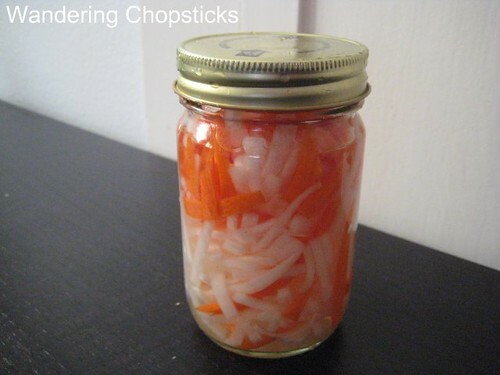 The carrots and daikon should be lightly pickled after about half an hour. Store extra pickles in a glass jar in the fridge and you've got do chua handy for whenever you want to add pickles to any kind of sandwich. I've been looking for a recipe for these pickled vegetables. You won't believe how many times I've eaten banh mi and they don't give me enough of these pickled vegetables! Now I can make my own. Thanks for sharing. Not enough pickles? I always seem to get too many. Last time, my sister got them on the side and I had so much leftover, I just added it to my pickle jar. i am a fan of Viet pickle, but the vinegar in Vietnam is made from banana so it has a very light and mild taste, but here, i only can find vinegar with grape or apple, very strong to me, do you have any tips for that? thanks? I've never heard of Vietnamese vinegar being made from bananas. Only rice vinegar, which I suggested in my recipe if you want a lighter taste. In case anyone else is wondering...the vinegar used in SE Asia was traditionally made from palm trees and has a lower acidity, similar to rice (4%). Distilled white vinegar and cider vinegar created for canning has a significantly higher acidity, needed for preserving food safely. In the West, look for palm or banana vinegar in markets near Filipino communities or, to approximate its milder bite, just dilute regular white vinegar slightly before using. Thanks for the explanation! I'll have to look for banana vinegar. Never knew VNese used it. I've been meaning to thank you for this recipe for a while, I have a jar in my fridge that gets a fairly regular rotation. They are especially awesome on my Banh Mi inspired Nem Nuong burgers. Without the Vietnamese Pickled Stuff they wouldn't be as awesome. That's great to hear. Nem nuong burgers sound awesome. It's so simple, but pre-julienned carrots is simpler. Ha!